(CNN) -- A grandmother, mother and her child died when a military fighter jet crashed into a house in San Diego Monday, igniting a huge fireball, CNN's San Diego affiliates and the San Diego Union Tribune are reporting. 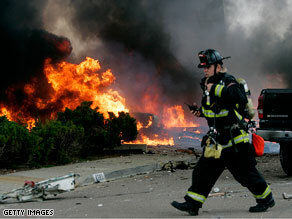 Fire rages in a San Diego neighborhood where an F/A-18 jet crashed Monday. Another child is missing, authorities said. A search ended Monday when night fell but will continue Tuesday morning, a spokesperson for the medical examiner said. The father is a businessman who was at work at the time of the crash, and was not reached for comment, according to the Tribune. The paper also reported that Monday night, a pastor and congregants at the family's church, the Korean United Methodist Church of San Diego in Clairemont. The pastor told a television station that the mother was in the home with her two sons -- a 2 month-old and 1 year-old. The mother was a nurse at a hospital. "Then all of a sudden we saw the canopy of the jet explode and go up, and then we saw the pilot blast out of the plane and the parachute open," Lerner said. The pilot, whose name was not released, was the only occupant of the two-seat aircraft, according to the Marine Corps. The Tribune spoke with Steve Diamond, a retired naval aviator, who found the pilot in a tree behind a house and helped the man who Diamond said was a lieutenant in his 20s, down from the tree. The pilot told him that after he lost power in the first engine, and that it was decided he would try to get the jet to Miramar on the single working engine, Diamond told the paper. The pilot was in communication with military air traffic controllers before the jet crashed, and the crash site is about two miles (three kilometers) from the airfield, the Federal Aviation Administration said. Inside one of those houses, Robert Johnson sat in the living room with his daughter, Heather Certain, and her 2-year-old son, Nicholas, according to the San Diego Union Tribune. They heard the explosion then saw a giant fireball in their picture window facing their front yard, the Tribune reported. They ran out of the house. "The house shook like an earthquake," Johnson said. "I saw the flames right there in front of my house." iReporter Chris Morrow of San Diego said she went to the crash site Monday and saw "Two houses that looked liked they'd blown up."